J. Anand has wielded his magic wand on the Tata Tiago and the small petite hatchback has turned into an in-your-face pocket-rocket. The Tiago JTP, as it is being called, gets almost 40 per cent more horsepower, a tuned suspension and a setup to go fast not only on the straight line, but also around corners. And, to go along with the flow, it also gets fancier styling elements. Amongst the visual differentiators are the different bumpers both fore and aft that have been chiselled to exude performance. Offset breathing gills on the hood stand out due to their bright popping colour and so does the JTP badge on the grille. The outside rear view mirrors are contrast coloured and the dram in the back is accentuated by the splitter and the twin exhaust. Inside, there are not many changes on the top-spec XZ trim of the Tiago apart from the highlights on the dash and the contrast stitch on the upholstery and the JTP badges on the headrests. And you get all of this for just about Rs 1 lakh over the top-spec manual XZ trim of the Tiago and that seems to be a great deal. That’s because the Tiago JTP offers a fully loaded Tiago with performance matching the bigger hot-hatches like the Baleno RS, the Polo GT TSI and the erstwhile Punto Abarth. While the Baleno and the Polo lose the horsepower race, the Punto Abarth isn’t too far behind because of the Tiago’s weight advantage. And all of these cars are priced above Rs 9 lakhs ex-showroom whereas the Tiago JTP comes in at just Rs 6.39 lakhs. If you want to let go of the performance, you could get yourself mid-variants of hatchbacks like the Maruti Swift or the Hyundai Grand i10 or the Ford Freestyle in petrol or base trims of these hatchbacks in diesel. 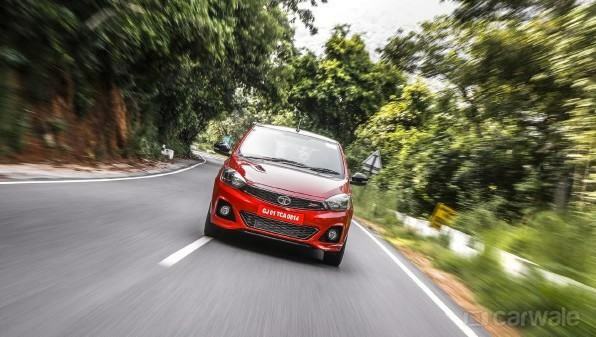 If opting for base models is not an issue, the petrol-powered compact hatchbacks are also well within reach along with premium hatchbacks like the Hyundai Elite i20 or the Honda Jazz.